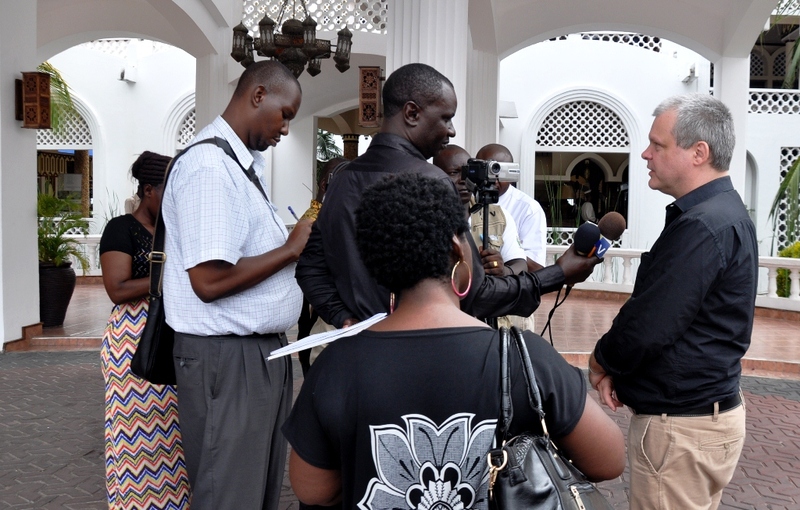 Central Africa Hub Director Bernard Vanlauwe being interviewed by the media. 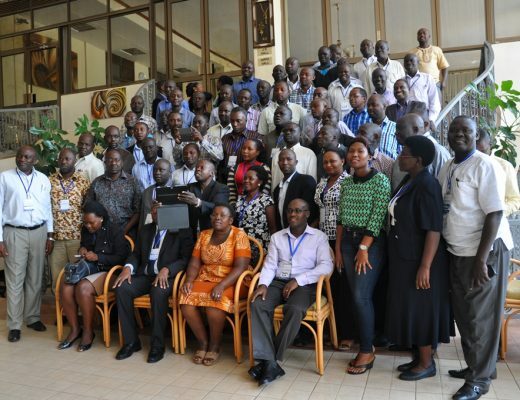 The African Cassava Agronomy Initiative (ACAI) — Taking Agronomy to Scale in Cassava-Based Systems in sub-Saharan Africa, seeking to address this challenge and support smallholder farmers to increase production of cassava through developing good agronomic recommendations, recently launched its activities in Tanzania. This was reiterated by guest of honor Hussein Mansoor, Director of Research and Development at the Ministry of Agriculture, Livestock and Fisheries. He noted that much investment in cassava production had gone into development of improved high-yielding disease-resistant varieties and less on cassava agronomy, and thus the persistent high yield gap. “With the need to intensify cassava production in areas where population densities have reduced access to land for agriculture and with cassava roots becoming an important raw material for the processing sector, the yield gap needs to be reduced. This requires investments in inputs and labor and access to fresh root markets or value-adding processing markets to ensure that farming households can generate the income required,” he said. ACAI project participants during the launch. Lawrence Kent from the Gates Foundation said the Foundation was keen on the project due to the link between improved varieties and good agronomic practices. 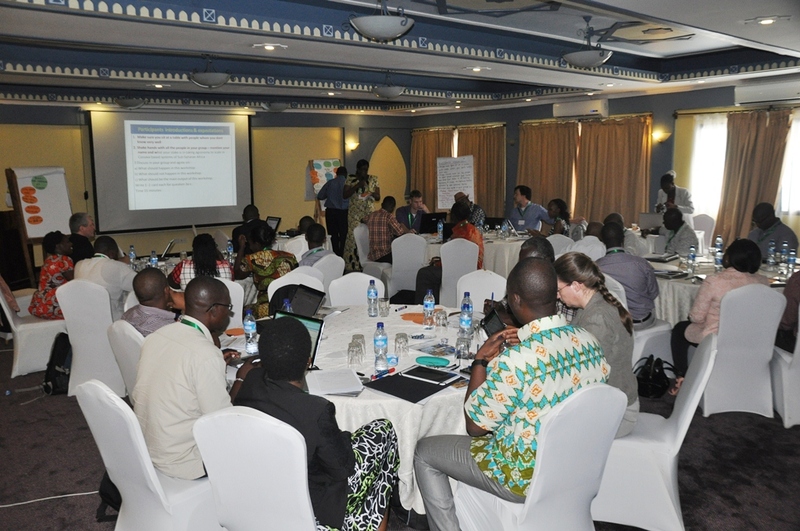 research and uptake of the findings and between research and extension and demand-driven approach by working with partners in the cassava value chain to addressing their priorities and concerns. ACAI seeks to improve cassava yields, cassava root quality, cassava supply to the processing sector, and fertilizer sales, and have over 100,000 households in Nigeria and Tanzania benefiting and creating a value of over US$27 million in the next five years. This value will result from increased yield of cassava and associated crops (due to intercropping), higher starch content, more continuous supply of the roots, and use of fertilizers among others. The project will also be implemented in Uganda and Ghana. Partners in Tanzania include Cassava Adding Value for Africa (C:AVA), Farm Concern International (FCI), Mennonite Economic Development Associates (MEDA), and Minjingu Mines & Fertilizers Ltd.